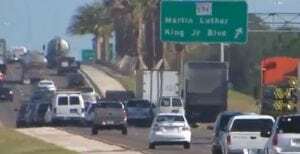 Florida’s Interstate 4 has been named the most dangerous highway in America — again. And Orlando car accidents are the main culprit. A 2016 report from online insurance broker Everquote put Central Florida‘s busiest highway on the map, in a bad way, when I-4 topped the list of the 10 Deadliest Interstates in America. A new recent study by GPS company Teletrac Navman confirms the dubious honor for the second year in a row. Over a five-year period, there were 1.25 deaths per mile on the roadway, the highest rate in the country. That translates to 165 auto accident deaths over a five year period. The deadliest section of the 132-mile-long I-4 is where it passes through Orlando. Over 200,000 drivers a day use the interstate in the city. While the sheer volume of traffic may account for the increased danger of the Orlando section of the highway, the most likely cause at present is the ongoing I-4 Ultimate Improvement Project. The six-year, $2.3 billion construction project is an ambitious makeover. Workers are rebuilding the 21 mile stretch of I-4 between State Road 434 in Seminole County and Kirkman Road in Orange County. According to a WESH-TV News investigation, Orlando car accidents have increased by 14% on the section of highway under construction. The WESH report studied a 32-month period since work began. The number of accidents increased. However, because of the nature of highway construction, these auto accidents led to crashes with fewer deaths. But injuries were more serious. The study found that the most dangerous area in the construction zone is the five miles between Colonial Drive and Maitland Boulevard. In this section, there were nearly 1,500 car crashes, with 925 total injuries since construction began in 2015. One hundred Orlando car accident injury victims suffered serious, incapacitating injuries that required hospitalization. Drive carefully. Don’t speed or tailgate. Be extra cautious in construction zones. If you or a loved one are injured in a car accident, call the Orlando car accident attorneys at Martinez Manglardi at 407-846-2240 for a free consultation.